What is Watch D.O.G.S (Dads Of Great Students) is an innovative father involvement, educational initiative of the National Center For Fathering. There are two primary goals of the WATCH D.O.G.S. program. 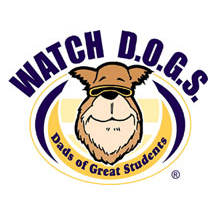 WatchDOGS are fathers, grandfathers, uncles, and other father-figures who volunteer for at least one day each year at an official WATCH D.O.G.S. school. During the day, WatchDOGS may read and work on flash cards with students, play at recess, eat lunch with students, watch the school entrances and hallways, assist with traffic flow and any other assigned activities where they actively engage with not only their own students, but other students as well. Many school principals have reported that the mere presence of a WatchDOG dramatically reduces reports of bullying. On the day of their participation, WatchDOGS are given a brief review of their involvement and they wear an official WATCH D.O.G.S. t-shirt with a disposable ‘Dog Tag’ identifying them as WATCHDOGS. WATCH D.O.G.S., a K-12 program, invites fathers, grandfathers, uncles, or other father figures to volunteer at least one full day at their child’s/student’s school during the school year. Individuals sign up at a ‘Launch Event’ such as a “Dads and Kids Pizza Night” or “Donuts with Dad” or in the office at any time throughout the school year. The program is overseen by a “Top Dog” volunteer who partners with the school administrator to coordinate scheduling and identify opportunities for WatchDOGS to provide assistance at the school. WatchDOGS volunteers perform a variety of tasks during their volunteer day including monitoring the school entrance, assisting with unloading and loading of buses and cars, monitoring the lunch room, or helping in the classroom with a teacher’s guidance by working with small groups of students on homework, flashcards, or spelling. **Fill out a Watch D.O.G.S Application (SEE LINK BELOW) and purchase your official Watch D.O.G.S t-shirt (See attachments). At CME, Watch D.O.G.S must also be cleared volunteers through the school. All forms are also available in the office. Are you a dad interested in volunteering for the day as a Watch D.O.G.? Please click the link below to find a day and sign up! CLICK HERE TO SIGN UP FOR YOUR DAY(S)!!! Once you have been scheduled you will see your name on the calendar below on the day you are assigned. IMPORTANT: Please include your child's name and teacher in the comments section to allow for us to schedule you accordingly. We look forward to seeing you here at CME!